Whether to work, to school, or just out into the field with the sheep after gobbling up all the treats, I hope your Tuesday was a good one—or at least bearable. 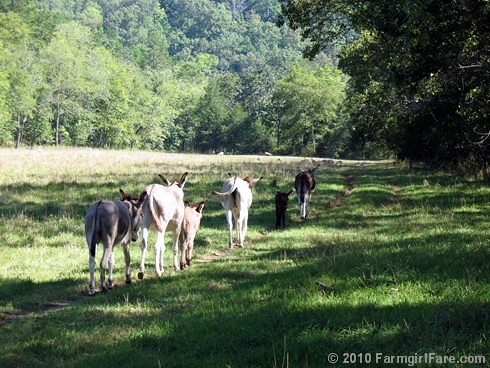 © FarmgirlFare.com, the orderly, no pushing (well, mostly no pushing) foodie farm blog where the hoof trails wind lazily through the fields, and everybody likes to stay on them—including me, even though I know walking a straight line would be faster. I feel like following them. What a delightful photo! As it was, I had a stressful Tuesday but just looking at this photo makes me SMILE! Inquiring minds want to know... do they always walk in the same order or do they mix it up? I think this blog is good for my blood pressure! Such a peaceful pastoral scene. And oh I loved those dogs of yours on the last post wallowing around - they are so beautiful!